So, it has come to this. A building that was so poorly designed and built, that it will now require $200 million or more (pdf) to rebuild it just 35 years after it opened its doors. Loathed by many, the Portland Building is by far the most out-of-place piece of architecture in the Pacific Northwest. Despite the general disdain and high-profile criticism, this Postmodern shlock was christened a historic landmark at the spritely age of 29 years old, which is an absolutely ludicrous notion in itself. The backers of the historic designation knew that the moisture-prone midrise’s days were numbered, and right they were, as this week we finally got to see what the city and DLR Group want to do with their landmark: replace it. Completely. Seriously: 100% of the exterior. 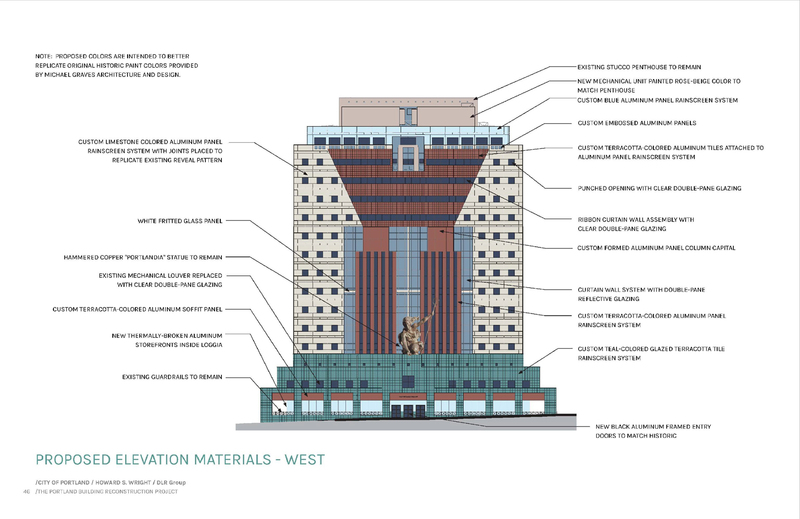 Oh, wait, they are keeping some of the ground floor guardrail, the Portlandia statue, and the stucco mechanical penthouse, but everything else, the entire facade and the majority of the interiors, are now proposed to be replaced. This recladding, retrofitting, and renovation project is doing more than just replacing deteriorated and damaged materials as one might expect; the recently unveiled scope includes rebuilding the entire envelope with completely different systems and materials that were never part of the original design, removing the parking garage entrance facing Chapman Square, and infilling the well-intentioned but poorly executed loggia at its sides. The renovation team does have good reason for their proposed radical makeover: in professional architectural jargon, the building is, in fact, a turd. Regardless of what judgment one casts on the aesthetics of the architectural work, the building itself is odious to the urban environment and unfit for its function for numerous reasons. The people who work in its dark doldrums every day are the most vocal critics; noting the pastel tower is prone to moisture infiltration, has very little access to natural light and ventilation, and has the ground floor civic presence of an unkept toilet with a broken tank cover and a bowl full of cigarette butts. The original budget and value engineered construction are often cited for its current plight, but a good deal of the blame should also be borne by the architect, the late Michael Graves. What Graves and the other Postmodernists were doing at the time was radical, as their experiments were the launch pad for getting the profession out of the melodrama created by Modernism’s magisterial maleficence. Unsatisfied with the architecture profession diluting itself into a mere ceremonial role, Graves pushed back against the devotee’s doctrines of less is more, form follows function, and ornament is crime. Postmodernism was an avant-garde attempt to bring back the art of architecture, revive classical sensibilities, reintroduce decoration, and savor the significance of typologies. 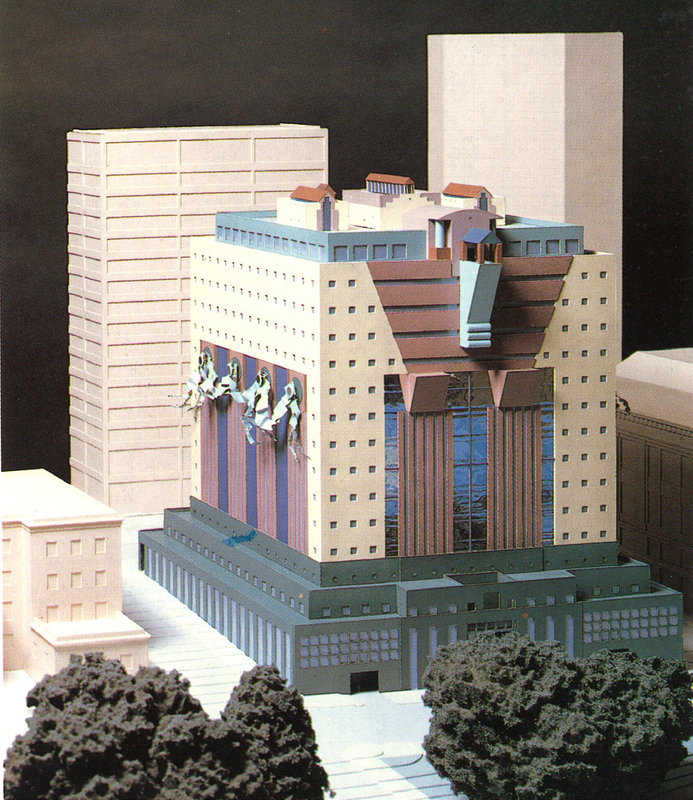 Postmodern architecture was about whimsy and humor, exploration and emotion. 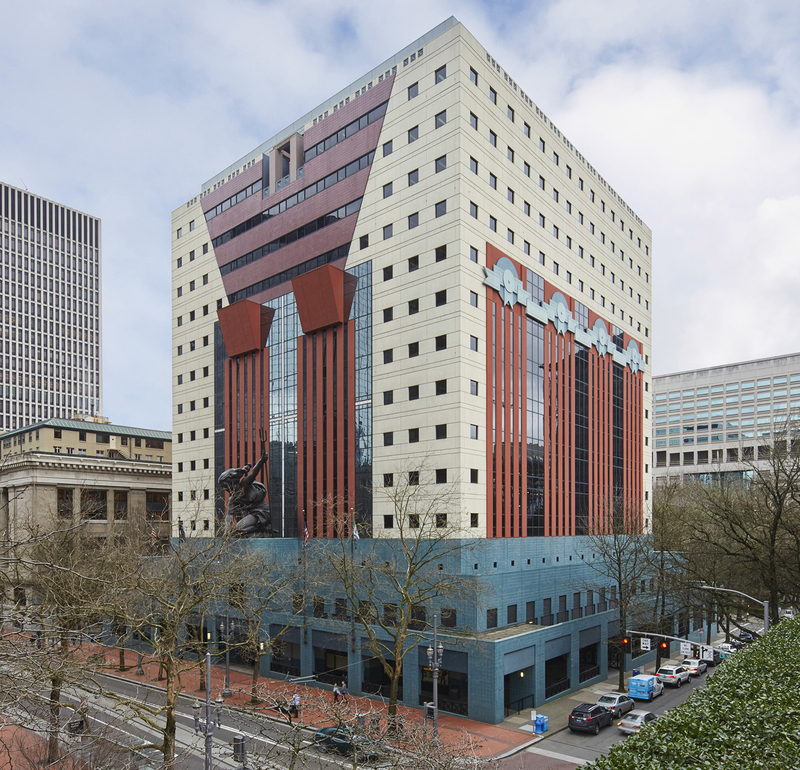 Postmodernism was about being different, and that was the rub, as pioneering something different always has a learning curve, and the Portland Building was a little too ambitious for its own good. 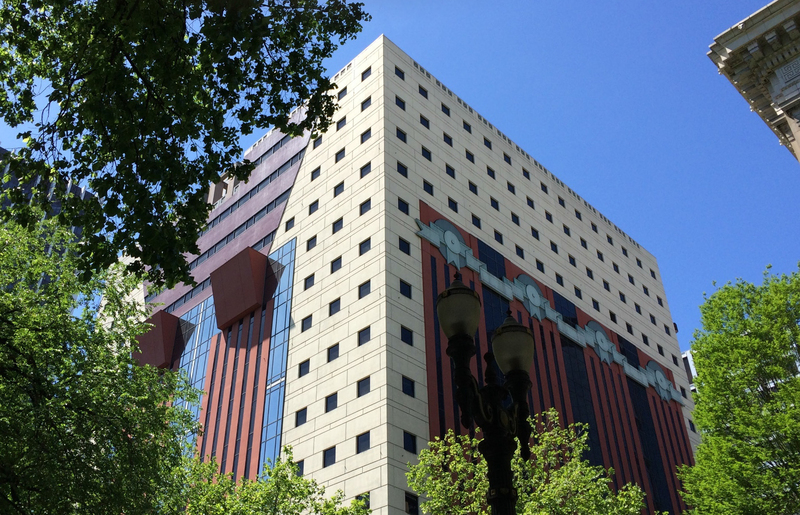 Many have and will argue that the Portland Building is worth preserving as one of the most well-known examples of built Postmodernism. Which is almost true, as there are arguably better examples in other cities, from Graves, Venturi and Scott Brown, Moore, and even Philip Johnson, that were built for the test of time and still retain some influence and grace. This building’s only lasting relevance is a big fat reminder of what not to do in the future. 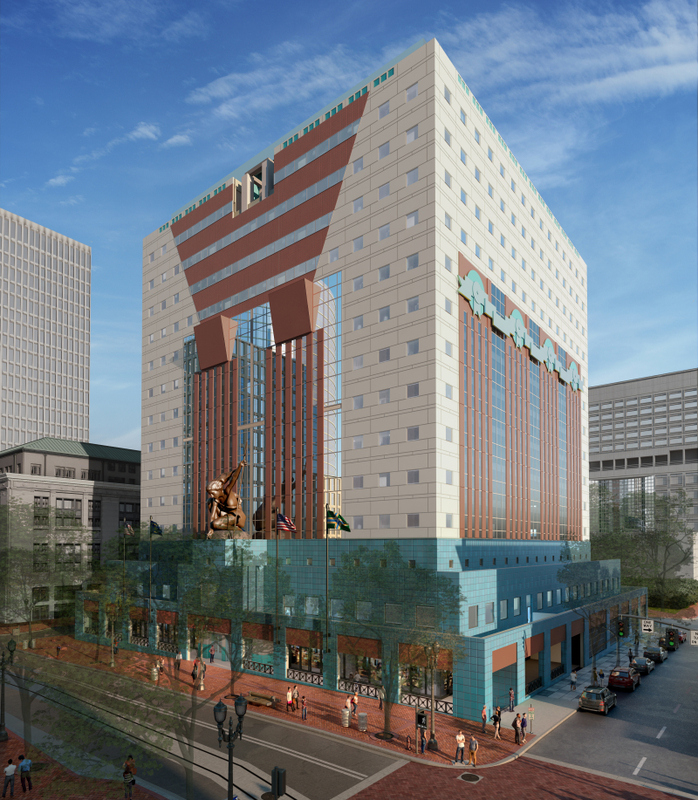 As Pietro Belluschi once famously quipped: “[The Portland Building] will put Portland on the map, architecturally, and it will never be repeated.” Yet here we are, spending top dollar to replicate a bad good-idea-at-the-time. Preserving through imitation, this is the ultimate satire for Postmodernism’s short-lived crusade: re-wrapping wrapping paper on a concrete box, or in this case, layering a new primarily metal panel facade system over a rain screen over the existing exterior treatments of said concrete box. This proposed move has made both preservationists and critics very unhappy, as it neither preserves the building’s original physique nor reduces the visual and spatial dissonance that it creates. The proposed recladding can be seen as doubling down on the city’s architectural embarrassment by stylistically replicating a style of stylistic replication. Postmodern architecture was itself a stylized replica of a stylized replica (Neoclassical) of a stylized replica (Baroque) of a stylized replica (Renaissance) of a stylized replica (Gothic) of a stylized replica (Gothic) of a stylized replica (Romanesque) of a stylized replica (Roman) of a stylized replica (Greek) of a stylized replica (Minoan) of other stylized replicas (from Egypt and Mesopotamia and elsewhere). Yes, that is an oversimplification and ignores the great advances in architectural technology and artistry at each step along the way, but the root concept is thus: people like nostalgia, so let’s do a new take on the old familiar. This was extremely profound and progressive at the time, but unfortunately, as it is the case for the Portland Building, that made for some rather ostentatiously chintzy architecture. Now, at least, the ostentatious architecture won’t be chintzy in materiality. In the end, after all this dust settles, most passersby probably won’t even notice the drastic change from stucco and concrete to painted metal panel or that the building envelope will soon be seven inches wider than before. 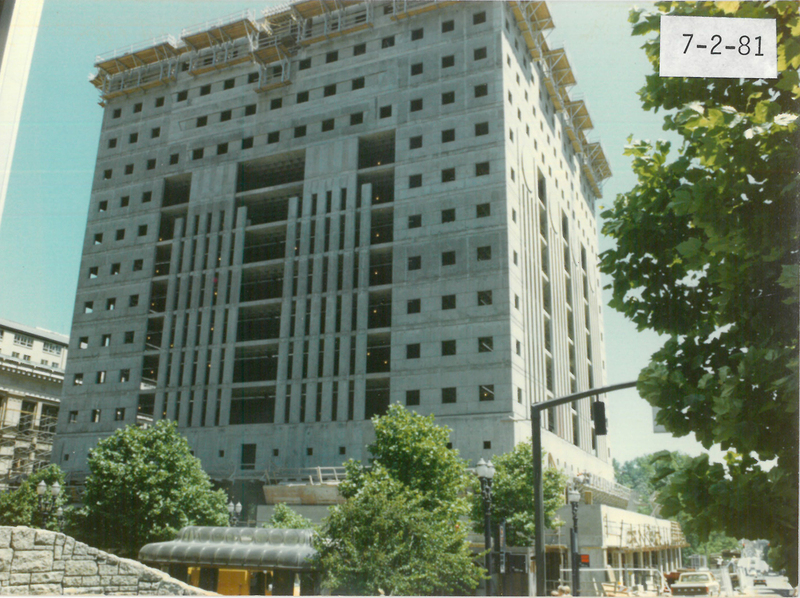 As time passes, people will start to believe that the Portland Building never had it’s back to the park and that the ground floor was originally designed to be inviting with floor-to-ceiling glass walls and open floor plans. New employees will never know what it’s like to experience the many building flaws and idiosyncrasies their older colleagues reminisce about from time to time. All of these redesigned rights are indeed correcting many of the original’s wrongs, but questions still remain: if everything is replaced, is it still the same building? What’s historic about it? Is it the idea, the concept behind Postmodern Architecture that’s being saved? If so, why not build it as Graves had originally designed it with flowing garlands and the miniaturized Acropolis on the roof? Then at least we would be preserving the intent, not the watered down version that’s irked so many over the years. That is where architectural nostalgia kicks in, the desire to keep things as they are, within the realm of the familiar, even if the design or element’s purpose is no longer valid; like a keystone on a concrete tower. I work at an architecture firm in Portland, and have lived here for 8 years now, but grew up in Scotland. I went to architecture school in Edinburgh, and I still remember the History of Architecture classes that I took when I was 18. The course covered everything from ancient Greece right through to deconstructivism (via a lot of lectures about Renaissance Italy). When we learned about post-modernism there was a short bit about Venturi’s ‘Mother’s House’ and ‘Learning from Las Vegas’…. and then most of the lecture was about the Portland Building, which is widely recognized as the first major work of postmodern architecture. It might not be the best executed or the most loved, but it is significant. It’s not an exaggeration to say that architecture students 5,000 miles away from Portland learn about the history of architecture from this building. The Portland Building is listed on the National Register under criterion C, which allows the listings of buildings that “embody the distinctive characteristics of a type, period, or method of construction”. I actually don’t particularly like the Portland Building (or post-modernism in general) but it’s hard to think of another building in the city that better fits criterion C. Love it or hate it, it’s our most important historic resource. With all that said, I entirely agree with the first half of the last paragraph. Replacing the entire facade and reworking the base is an entirely inappropriate way to treat a historic resource. It’s contrary to the Secretary of the Interior’s Standards for the Treatment of Historic Properties, and it’s contrary to the approval criteria in the Portland Zoning Code. I hope the Landmarks Commission reviews this case with the same care that they would for any other alteration to a historic landmark.